During the last days of our trip, before the Pongal holiday began, our team successfully put on a Career Day event for the children at the Learning Center! We wanted to present a higher education option to attendees, framing it as one path they could take in their lives. In this, we aimed to present other Thottiyapatti members who pursued higher education, since we believed these students can be seen as role models to the younger kids. 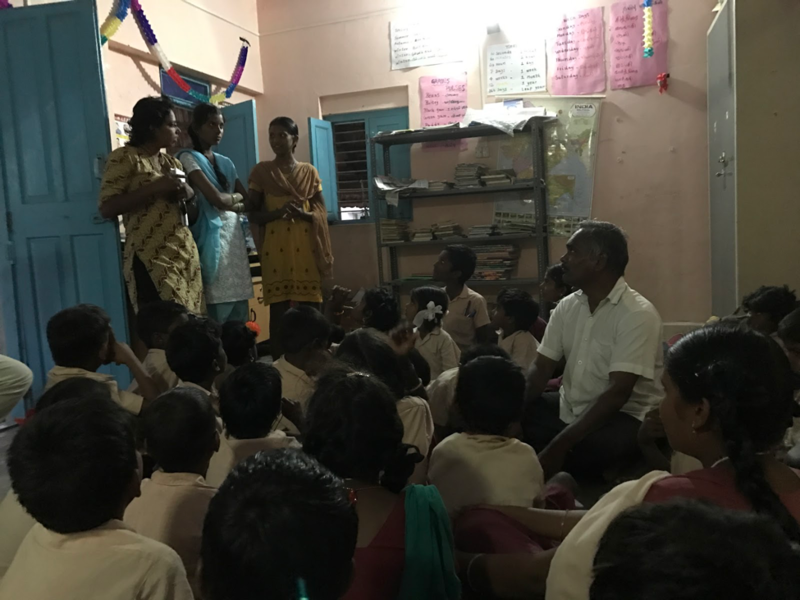 These members include Selva, a college educated teacher and Payir, as well as the two learning center teachers, Devika and Banupriya, and a local middle school teacher (also a Payir employee), Mr. Pachumuthu. Although we wanted to present the benefits of higher education and the variety of career choices available with completion of higher education, we were cognizant to present it as another option instead of as a better way of life. The students of the Learning Center were extremely happy to see Selva and Mr. Pachumuthu, whose presence in the Learning Center seemed to revive a sense of excitement and passion for education. The event also emphasized the importance of coming to the Learning Center. Our team’s original motivations for doing this was a first step to addressing the recent problem of lower attendance of the Learning Center post-exam season. To accomplish this event, we not only worked with members of Payir, but also attempted to spread the word throughout the community, as we realize that news of events like this happen best through word-of-mouth. In the end, we considered it a highly successful event, and even we engaged in some Q&A with the children before starting that day’s regular Learning Center activities. Before leaving, we also made sure to get some supplies for the Learning Center, including pencils, chalk pieces, and notebooks. Though we have purchased these supplies each visit in the past, we have begun conversation about finding a more sustainable model for supply replenishment, which will most likely come in budget allocation through the help of a Payir employee and the Learning Center teachers. This way, the Learning Center can take on more of the ownership of supplies acquisition and organize a system to ensure that there is a steady source of supplies. In our final two days, we continued to build relationships with the community through participating in their Pongal celebrations. Pongal is a Tamil holiday to celebrate the harvest. We partook in the festivals and games held by Thottiyapatti members, and were invited to share a meal with the village head’s family and friends. Furthermore, we were able to go about the village and thank our partners and friends for the amazing work they’ve done, and witness firsthand how Thottiyapatti residents observe their harvest festival. Our final night took place on Mattu Pongal, which is meant to celebrate and appreciate the role cows play in our lives. This ritual involved a parade of decorated cows throughout the village. It provided us a great opportunity to learn more about the community we work with and build relationships with them in various capacities.